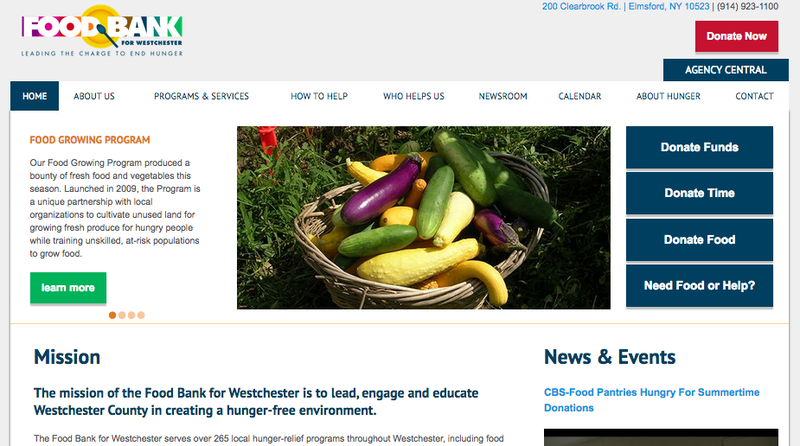 Food Bank for Westchester? (FB4W ) is Westchester’s organization that aims to prevent one out of five of your neighbors from going hungry, by distributing?14 tons of food per day to those in need. Established?in 1988, FB4W now distributes?food to 265 programs in the region, such (like soup kitchens, shelters, daycare and after school programs and residential programs) that directly deliver food to the 200,000 Westchester residents who are at risk of going hungry half who are children and senior citizens (33 percent who?are children and 22 percent who are senior citizens). In 2014, they debuted their Kraft Mobile Food Pantry that travels to neighborhoods to directly deliver fresh and perishable foods to residents. FB4W distributed 7.2 million pounds of food in 2013-14 and had 8,747 volunteers donate 19,882 hours. The organization is able to buy $4 worth of food for every $1 you donate, so your donate is quadrupled! Want to show how grateful you are for Food Bank for Westchester? You can donate funds to the Food Bank for Westchester here;?can start a food drive?or donate food; or?learn more about volunteer opportunities here. Or you can attend the?25th Annual An Evening in Good Taste?fundraising event on Oct. 22 at 1133 Westchester Ave. in White Plains from 6:30 to 9 p.m.